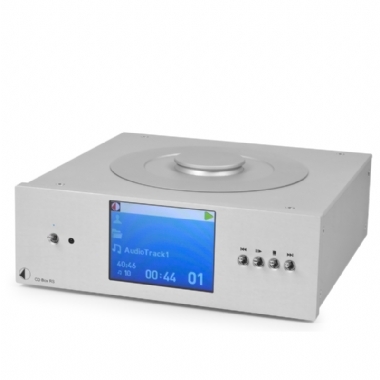 The ProJect CD Box RS is a superlative top-loading CD transport that is built around the premium Blue Tiger CD-100 servo system, which is designed to handle 24-bit/192kHz FLAC playback. The CD Box RS is an elegant device that uses a stylish functional top-loading gravity design and a convenient magnetic clamp. Additional weight at the bottom of the casing draws unwanted vibrations away from the playing surface, while advanced suspension system allows for a playing disc to spin true. Connection to external sources is achieved either by S/PDIF coax, optical or AES/EBU. Alternatively, for perfect matching with the DAC Box RS or Pre Box RS Digital, an innovative RJ45 I2S/Master Clock connection option is also available. The CD Box RS is easy to control thanks to the included IR remote and clearly-marked front controls.